Iris Eytan and Dru Nielsen, founding partners of Eytan Nielsen LLC, have been selected to the 2018 Colorado Super Lawyers list. Iris Eytan was named to the Super Lawyers list in 2006-2007 and consecutively listed since 2009. Dru Nielsen has been named to the Colorado Super Lawyers list annually since 2012 and was a Colorado Rising Star in 2010 and 2011. 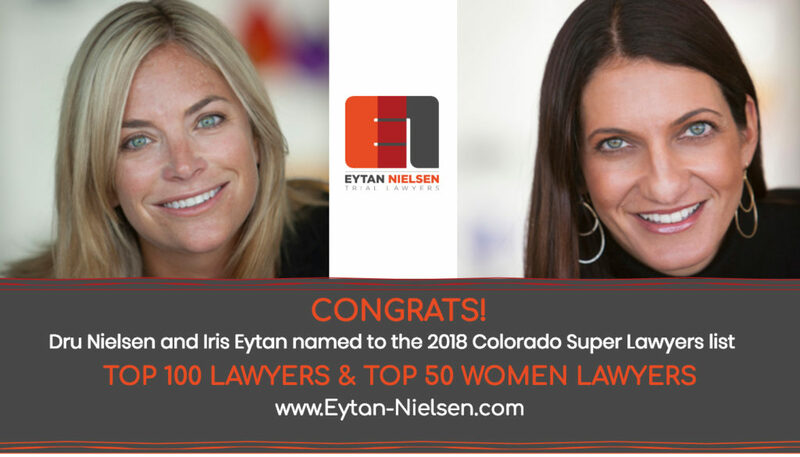 For many years, both Iris Eytan and Dru Nielsen have been named to the Top 100 Lawyers in Colorado overall and the Top 50 Women by the publication. They were also a featured in the cover story of Colorado Super Lawyers Magazine in 2017. Each year, no more than five percent of the lawyers in Colorado are selected by the research team at Super Lawyers to receive this honor. Super Lawyers, a Thomson Reuters business, is a rating service of outstanding lawyers from more than 70 practice areas who have attained a high degree of peer recognition and professional achievement. The annual selections are made using a patented multiphase process that includes a statewide survey of lawyers, an independent research evaluation of candidates and peer reviews by practice area. The result is a credible, comprehensive and diverse listing of exceptional attorneys. The Super Lawyers lists are published nationwide in Super Lawyers Magazines and in leading city and regional magazines and newspapers across the country. Super Lawyers Magazines also feature editorial profiles of attorneys who embody excellence in the practice of law.